This is one of my favorite stir-fry rice vermicelli with clams or known as Fried LaLa Bee Hoon in Hokkien dialect. 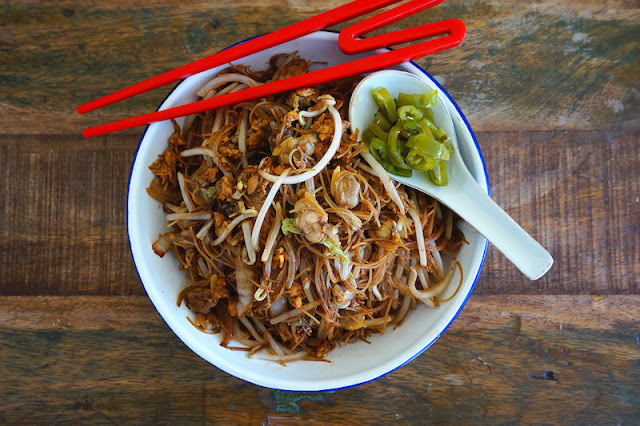 It's a popular dish in Malaysia, and yet it's so easy to make it at home. Here, I have used frozen clams, but you can always opt for fresh clams, if available. Heat peanut oil a large wok over medium high heat. Add ginger and garlic until stir-fry until golden in color. Turn the heat to high and mix in the eggs. Cook until the eggs are set. Then add yellow onion and give it a quick stir. Mix in the cabbage, rice vermicelli, clam juice, light soy sauce, and dark soy sauce. Mix until well combine and season with salt and pepper. Use a tong and spatula to mix the rice vermicelli into the sauce. When the sauce is almost dry, mix in the bean sprouts and clams. Continue to stir-fry until all the ingredients are well mix and the bean sprouts are just cooked, and adjust the seasoning with sea salt. Serve warm.